The new Abby Abernathy is a good girl. She doesn’t drink or swear, and she has the appropriate number of cardigans in her wardrobe. Abby believes she has enough distance from the darkness of her past, but when she arrives at college with her best friend, her path to a new beginning is quickly challenged by Eastern University's Walking One-Night Stand. Let’s start with the novel’s cover. 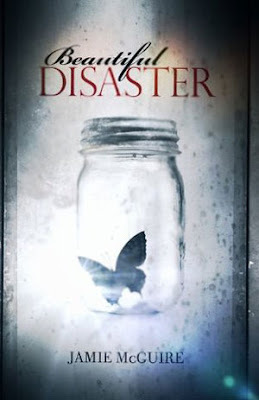 The simple but mesmerizing cover image, displays a beautiful blue butterfly trapped inside a plain mason jar. Right off the bat, my head spins with symbolic conspiracy theories that connects well with the story. Traditionally, the butterfly symbolizes transformation. Transforming from this small always hungry caterpillar who then takes about a month’s worth of sleep, only to pop out a pair of big beautiful wings and fly off to their new chapter in life. Many of us relate to the butterfly’s journey of transformation, (especially with the whole always hungry and gets a month’s worth of sleep) but this butterfly here is trapped. The way I see is that the butterfly is trapped or stuck in the past; it has trapped itself in this protected but lidless jar because its scared to let go and fly off. This is such a relatable experience for all of us at one point in our lives. Being your slightly above average high school teen, who is living off the smell of caffeine I can totally relate to the butterfly protagonist is in this novel by purposely locking myself in this jar secured from the harsh reality of life. 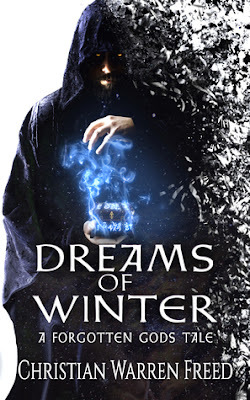 DREAMS OF WINTER by Christian Warren Freed! Senior Inquisitor Tolde Breed is sent to the planet Crimeat to investigate the escape of one of the most deadly beings in the universe. Amongeratix, one of the three sons of the god-king is loose once again, the fabled Three. 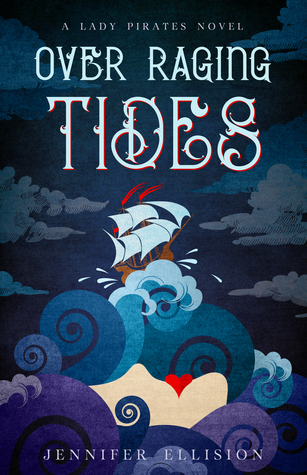 Tolde arrives on a world where heresy breeds insurrection and war is only a matter of time. Tolde is aided by Sister Abigail of the Order of Blood Witches in his quest to find Amongeratix and return him to Conclave custody before he can begin his reign of terror. What he doesn’t know is that the Three are already operating on Crimeat. Each serves a different emotion: Vengeance, Sorrow and Redemption. Their touch drives the various characters beyond themselves and towards an uncertain future that can only end one of two ways. Either the Three win and finally destroy the gods, or humanity stops them and continues to survive. The Bloody Man arrived at night. Twice the size of a mortal man, he didn’t move, didn’t even blink. The villagers of Kovlchen were both frightened and amazed. No one had ever seen anything like this before. Prayers were whispered, blades sharpened. The man was heavily muscled, sculpted almost, and completely covered in dark crimson blood. Arms at his sides, he stared out at the world with empty eyes. Villagers flocked to see the Bloody Man, if such a being might be called a man. Those daring enough moved closer, eager to get a better look. Mothers hurried their children home, lest they become contaminated or infected. A week passed and with it the novelty. People talked less of the blood covered man. The mayor and constable decided that, while the man had not so much as blinked during in the time since his arrival, something had to be done. They sensed a latent threat and gave voice to that paranoia. A town meeting was called in the local tavern. “But he has done nothing,” farmer Aenni reasoned. The old man was well known for his wisdom. “How can we act against a being that doesn’t even seem to breathe?” “That is not the point! Sure, the bloody man may not have acted against us yet, but that is not to say he won’t soon,” Zenningberg insisted. A chorus of cheers and murmurs filled the room. The people were frightened. That much was certain. An undertone of fear laced the smoke thickened air. Old and young alike could feel it. Danger lingered just beyond the borders of common sense. The bloody man was a danger. He must be dealt with. Zenningberg held up his hands for silence. It took a moment, but the crowd finally stopped their chatter long enough for him to continue. Zenningberg caught the familiar face of Prentiss. He snorted. The lad was the local troublemaker, a youth who did not see the value in the wisdom of his elders. The boy needed to keep his mouth closed and go about his business. “How can you deny otherwise?” came a frail voice from the back of the room. All eyes turned to see Father Dorchea striding towards Zenningberg and the podium. The Father was the most respected man in the village. When he spoke, people listened. His stern eyes leveled on the crowd. He was a thin man, old and covered with liver spots. His hair, what was left, was thin, close cropped and streaked gray. “This Bloody Man is a message, sent to us by the Gods to confront our sins against the Fathers,” he told them. “Father, the gods do not always interfere with the whims of man. What have we done to draw the wrath of the gods?” asked the mayor. Arguments spread through the crowd. Some for, some against the continued presence of the Bloody Man. Perhaps the worst part of the situation was that gnawing uncertainty buried within each of them. Uncertainty can be a powerful emotion; strong enough to spark unabashed fear or peak the highest curiosity. Fear slowly won out. The tide of emotions turned towards the bitter prospects of the potential horror the Bloody Man represented and how best to deal with the situation. Dorchea nodded and dropped down to comfort poor Jarris. “He has already killed once, are you so willing to let him do it again?” Zenningberg asked. The simple answer was chilling. An eerie silence settled over those gathered for a tender moment. The atmosphere stifled. A choking feeling hung at the back of everyone’s throats. Jarris Thoom solved it all in a single act of violence. Hatred and rage collided in his mind, creating a super emotion that no sense of morality or reason could overpower. He looked up at the young Prentiss. “That thing killed my little girl!” he roared. Jarris moved quicker than anyone anticipated. On his feet and dagger drawn before they could react, he plunged the old, nicked blade deep into Prentiss’ chest. The youth fell with a cry, dark blood flowing down his tunic. In that moment every bird launched into the sky. A thunder clap so loud it shook the foundations of the world began a whirlwind. The Bloody Man blinked once. The emotions he felt were indescribable, but he’d felt them before. More than once he had been forced to act in response, lest they become too much even for his soul to bear. Strength filled his muscles and his skin danced with electricity that glowed blue in the dark of night. The first to die were those closest. At nearly twelve feet tall and thicker than three men put together, the Bloody Man swung his fists like clubs, smashing and crushing bone and muscle. Men and women ran screaming. Some tried to make a stand, but it was not enough. Nothing was enough to stem the tide of violence pouring from the Bloody Man. It was a scene from Hell. Broken bodies began to pile up. Hatred so deep it set fire to every building in sight consumed the village. The Bloody Man did what the gods had created him to do. He killed. And killed. And killed until there were none left to oppose him. Mayor Zenningberg died from fright. His old heart couldn’t comprehend the sights opened to him. Father Dorchea knelt before the Bloody Man and prayed for those few moments before his head was crushed like a piece of rotten fruit in the Bloody Man’s mighty fist. And then the Bloody Man stopped suddenly. His eyes opened and he saw the devastation he had caused for the first time. Not a soul lived in the village of Kovlchen. Even the smallest dog and youngest child had been killed, their bodies a travesty of human form. Homes and shops were leveled. The entire area looked as if a massive earthquake had ravaged it. He tilted his head back, horrified at what he had done. “NOOOO!” he cried, and dropped to his knees in misery. Not again, he shook his head. Not again. Tears spilled from his eyes. The destruction burned what was left of his heart, ate at the depths of his soul. Pain and suffering seemed his eternal companions and he didn’t know why. These people had done nothing to deserve the horror he’d unleashed. Murder. That’s what it was. Sheer, brutal murder. No one would ever learn what had happened to the quiet village of Kovlchen on that dark autumn night. An entire people were destroyed before the sun had the chance to rise. The Bloody Man cried for them all. Every last soul he sent back to his father caused a tear so large it created a sea of raw agony. He sank to his knees. The old doubt had returned to his soul. He remembered why he had fled humanity so many centuries ago. He wasn’t made for this life, but there was no alternative. The Bloody Man yanked himself to his feet. His movements were timid, like a scolded child. Ever had he been this way. The gods had cursed him. The Bloody Man walked through the carnage, praying for a sign of life. Death mocked his efforts. Agony filled faces stared back at him. He heard their twisted laughter echoing back from the depths of Hell. This seemed his lot in life. Suffering. His soul cried through the dark hours of the night. And then he found it. Found that single spark of life that suggested hope had not died. He knelt down beside the body of a small child and gently cradled her in his massive arms. A tear fell, splashing on her cheek. The girl groaned and breathed deep. She opened her eyes; radiant green and speckled with fear. She screamed and struggled in his grasp. He finally set her down, expecting her to flee. But she didn’t. She stood fast and stared back in wonder. “What happened to my momma?” she asked. Her voice was strained and broken. than he would like to remember. After spending more than 20 years in the active duty US Army he has turned his talents to writing. Since retiring, he has gone on to publish 17 military fantasy and science fiction novels, as well as his memoirs from his time in Iraq and Afghanistan. His first published book (Hammers in the Wind) has been the #1 free book on Kindle 4 times and he holds a fancy certificate from the L Ron Hubbard Writers of the Future Contest. 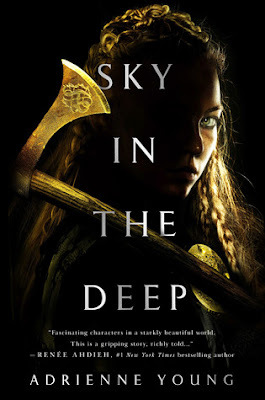 SKY IN THE DEEP by Adrienne Young! Describe SKY IN THE DEEP in 10 words or less. Adrienne Young: Blood, battle, more blood, loss, and a little kissing. SUMMER CONSTELLATIONS by Alisha Sevigny! Julia Ducharme is ready for a fresh start. Her little brother has finally recovered from a serious illness, and now she just wants to enjoy peak season at the campground her family owns. Maybe this will be the year her annual summer fling with Dan Schaeffer becomes something more? But her summer dreams are quickly shattered. First, Dan arrives for vacation with a new girlfriend in tow, and then Julia discovers this may be her last summer in the only home she's ever known. Crushing medical bills have brought her single mom to the brink of bankruptcy, and a wealthy developer is sniffing around the campground. He sees what Julia sees: lush woods, a pristine lake, miles of trails for adventure. Unlike Julia, he thinks this is the perfect spot for a casino resort. Heartbroken and afraid, Julia looks to the stars for some perspective. Taking her telescope down to the dock one night, she has a chance encounter with a guitar-playing boy who offers some helpful advice. Too bad this handsome stranger is the developer's son, Nick Constantine. As plans for a resort move forward, Julia is desperate to find a solution that doesn't mean leaving the lake. Nick, in turn, is desperate to separate himself from his father's aggressive business tactics. He promises that, together, they can thwart the sale. But can Julia trust him to conspire against his own father? And could she ever she trust him with her heart? 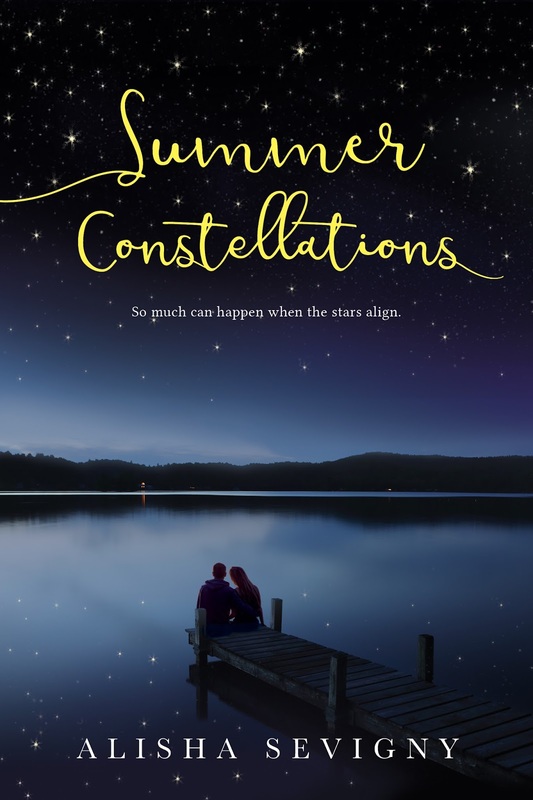 SUMMER CONSTELLATIONS is a story of lost summers, hidden treasure and love written in the stars. It is also a thoughtful reflection on what it means to love --- and leave --- one's childhood home. When I was younger, my family and I went to Muskoka for a week to spend some time by the lake and with nature. Reading SUMMER CONSTELLATIONS took me back to this time and added another dimension that I didn't know I was missing. I am now in my group chats trying to convince my friends we should go spend a week or two in the "wilderness" this summer. 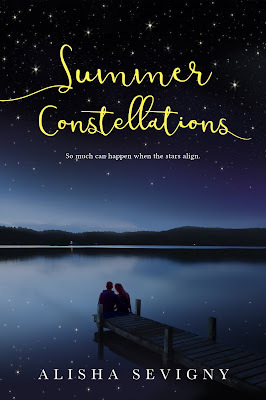 SUMMER CONSTELLATIONS has everything you need to be satisfied with a summer, contemporary, romance novel so I do hope you pick it up. So. This was good and I was really getting into it at the end. But it was way too short. Nothing truly happened. This felt like the first half of a book, not the first book in a series. I think if it was pitched as a novella, I would have been happier. 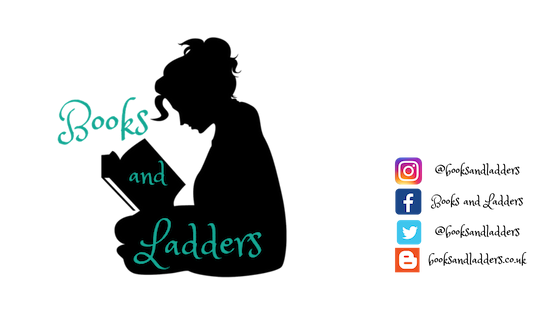 #Discussion: Book Perspectives + Recommendations! I like reading books that are written in different ways because reading the same type of perspective over and over is nothing but boring. I try to vary my readings to include first and third person perspectives (and sometimes even a second person here or there) depending on the type of book I'm reading and my mood. • It feels natural to most writers because we live in an I world. • You have to deal with only one mind: the narrator’s. • You can create a distinctive internal voice. 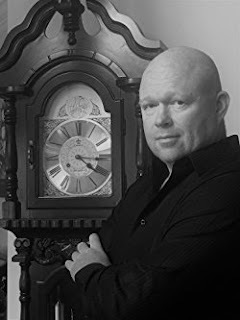 • You can add an element of craft by creating a narrator who is not entirely reliable. • You are limited to writing about what the narrator can see or sense. • The narrator must constantly be on stage or observing the stage. • You can’t go into the minds of other characters. 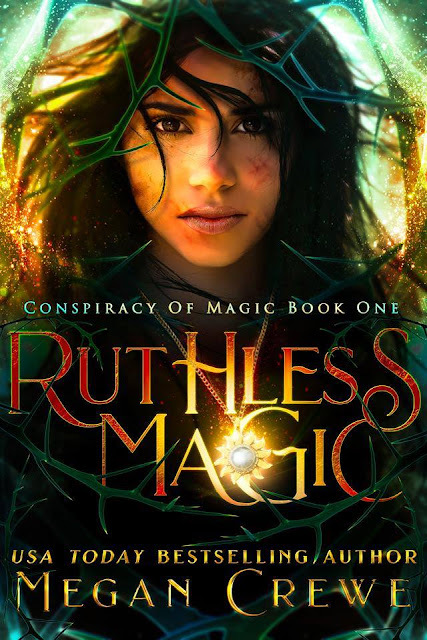 Today Megan Crewe and Rockstar Book Tours are revealing the cover and an exclusive content for RUTHLESS MAGIC, her new YA Fantasy which releases May 30, 2018! Check out the awesome cover and enter the giveaway! REYET TRAP by Dee Garretson! 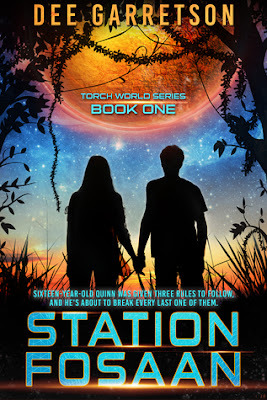 Quinn Neen and his friends have survived the uprising and the ruthless Fosaanian leader’s attempt to kill them, but the galaxy is still hurtling toward war. 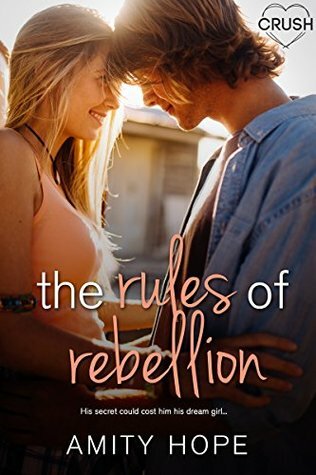 With just a few days before Quinn starts his mandatory military training, he plans to spend the time with Mira, the Fosaanian girl he’s in love with. When a mysterious message forces them on a journey to an isolated planet named Reyet, Quinn’s plans quickly change. 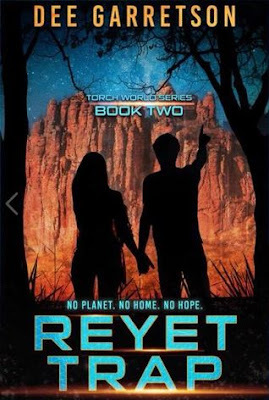 A coup on Reyet throws everything into chaos, leaving Quinn and Mira evading enemies they know, and some they don’t, including the planet itself. Now, time is running out for Earth, Fosaan, and Reyet, and there may be no place left in the galaxy that’s safe. Earth scientists and their families stationed on the remote planet of Fosaan were promised a tropical vacation-like experience. But Fosaan, devastated from an apocalyptic event nearly three-hundred years ago, is full of lethal predators and dangerous terrain. Earthers are forbidden to go beyond the safety zone of their settlement and must not engage the small population of reclusive Fosaanians, descendants of the survivors. Sixteen-year-old Quinn Neen plans to do both of those things. When Quinn discovers a beautiful Fosaanian girl named Mira stealing food from his family’s living unit, he soon learns Earth’s government may not be telling the whole truth about Fosaan and the cause of the past disaster. There are some who to restore the planet to its former glory by any means necessary. Quinn finds himself caught between his loyalty to his own people and what is right for Mira and her people. Before he can decide what to do, the scientists are taken captive, stranding the young Earthers on Fosaan. Quinn must go from renegade to leader and convince Mira to become an ally in a fight against an enemy whose very existence threatens their lives and the future of those both on Fosaan and at home. I love looking at book covers and I have to admit it’s hard for me NOT to judge a book by its cover. Authors anxiously await the first view of their covers, worrying the cover artist won’t capture the right feel for the book. I was therefore ecstatic when I saw my covers. They are perfect for the stories.